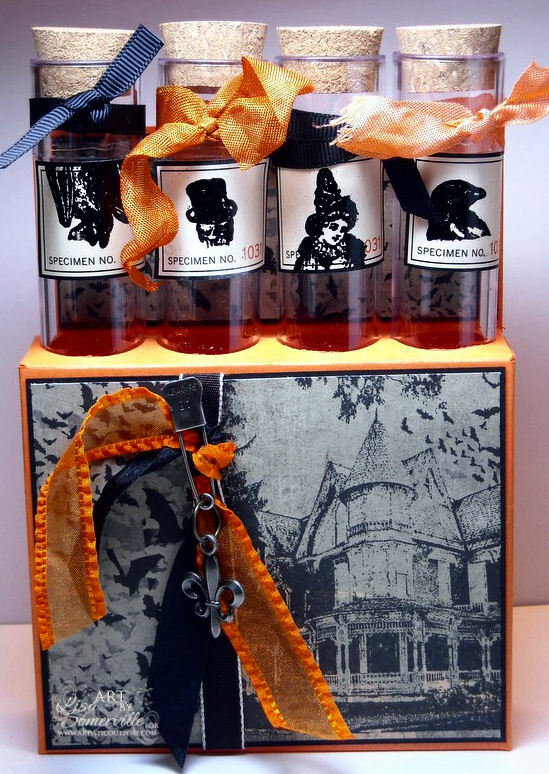 Designs by Lisa Somerville: Artistic Outpost Releases Neverland and Haunted Halloween! Artistic Outpost Releases Neverland and Haunted Halloween! I'm excited to share with you the newest stamp collections from Artistic Outpost, Neverland and Haunted Halloween. These new plates are available Mounted and Unmounted. Not only are there new releases at Artistic Outpost, but also a new section to shop from called Outpost Attic Findings which feature some truly vintage style finding kits that include beautiful ribbons and trims, for more on these wonderful kits, click here. I feel in love with Robyn's version of Tinkerbell on the Neverland Plate. Here, I did some creative masking to put Tinkerbell in the center of the Flower Collage, stamping both in Black Archival, then adding colors using the Marker Watercoloring Technique. 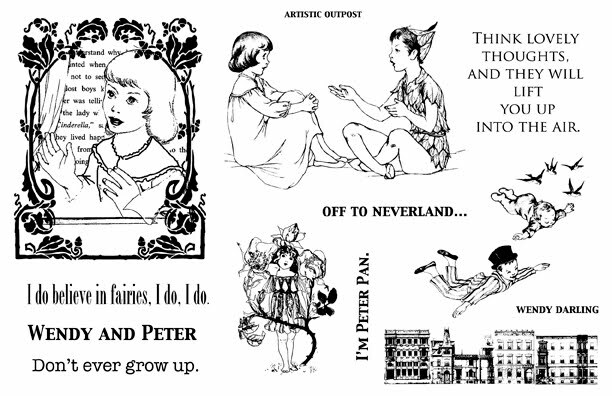 The Artistic Outpost Neverland plate features images from the fairytale land that is home to Peter Pan. 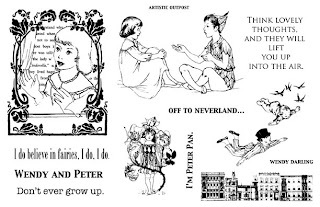 The Darling children are also featured with a lovely ATC sized collage of Wendy and a perfect flying illustration of John and Michael. Now onto a fun Halloween Creation! For my Haunted Halloween creation, I altered one of my Test Tube Holder Patterns. I created the Patterns for the Test Tube Holders a few years ago, and thought I'd update the 4 place holder a bit, by adding a 2" portion behind the Test Tubes. 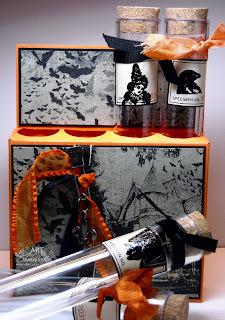 The Haunted House and Bats from this plate are stamped on a piece of Basic Grey Paper, then adhered to the Black Panel, then the Orange Box I created. I added some Ribbons and charm to decorate the box a bit. The labels came with the Test Tubes (Martha Stewart purchased a few years back), I stamped various images from this set in Versamark, and Black embossed using Ultra Fine Black EP. 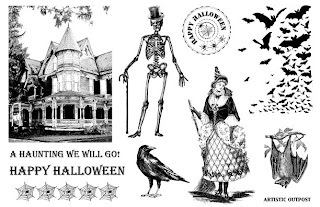 Artistic Outpost's Haunted Halloween is a Victorian inspired collection with vintage witch illustration a cane-swinging dapper skeleton, and a haunted home that could be used without the scary subtext. Other collage images include a bat border collage and sentiments. Wow, these creations are gorgeous! 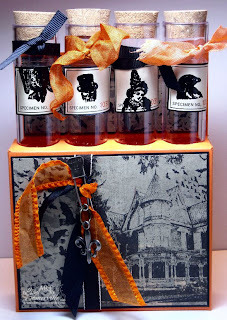 Fabulous idea to mask out the ATC stamp to include Tink, and I absolutely love your Halloween treat box - so clever! love the fairy card, and of course your signature candy holder and vials. adorable! once again - an outstanding job! Love both pieces of art! Love how you masked that frame ... what a perfect size for the cute little fairy ... and the Halloween creations is amazing ... so much fun. What fun today, new stamps, great ideas...Tinker looks swell framed and the TT holder is more FAB than ever. The masking of that frame is awesome! Love the Halloween set. From pretty to awesome! Love them both! Brilliant idea with the test tubes! WOW what great pieces of art. I truly love what you did with Tinkerbell. The use of the flower frame was brilliant. It goes so well with her. The test tube holder is so cool. I love how you used the images. Lisa, Your candy test tubes are a work of art! and such a sweet little Tinkerbell card! Great cards Lisa! And I LOVE the Halloween test tube treats! Love both projects but the test tube with the holder is fabulous!!! The design is so creepy and fun! ah Lisa what an amazing piece of art with the masked frame...love it. the Test tube creations rock.. So sure I had commented on your card...I must say amaging job on the masking...I thought of that and went nah...too hard. the frame is perfect for this image...super talented eye you have. I love that test tube holder!! What a great template- thanks for sharing! The little test tube treat holders are so cute! Great job! Beautiful work with the new releases!